Edmonton Transit’s vision is to be a fully integrated, progressive, easy-to-use, public transit system that supports economic development, and improves the quality of life in Edmonton. Edmonton Transit provides customer-focused, safe, reliable and affordable public transit services that link people and places. The Edmonton Transit Service (ETS) is Canada’s 6th largest transit agency. 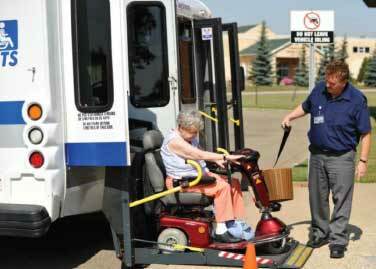 In 2008, ETS celebrated 100 years of public transit service to the community. ETS is the first agency in North America to introduce LRT to a city of under 1 million people, one of the first to provide standardized low-floor buses (accessible transit), and the first to link transit use to Air Miles rewards. Leger Transit Centre at Leger Road and 23 Ave opened in April 2009. It addressed increasing service requirements in the rapidly expanding Riverbend/Terwillegar area and connections to South Campus. The Lewis Farms Transit Centre opened in April 2011. With a park and ride lot of over 600 spaces, it is an ideal site for commuters from within Edmonton and nearby municipalities to travel directly into downtown. Eaux Claires Transit Centre at 97 Street and 157 Avenue opened in August 2011. It is designed to improve transit service to the neighbourhoods of Carlton, Oxford, Dunluce, Beaumaris, Lorelei, Baturyn, Chamberry, Elsinore, Lago Lindo, Klarvatten, Schonsee, Eaux Claires, Belle Rive, Mayliewan and Ozerna. It includes a park and ride site of 300 parking stalls with enhanced lighting, security cameras and emergency phones. The new Meadows Transit Centre at 17 Street and 40 Avenue opened in April 2010 and expands transit service in the neighbourhoods of Tamarack, Wild Rose, Larkspur and Maple Ridge. A paved parking lot adjacent to the transit centre has over 300 parking stalls with emergency phones, security cameras and enhanced lighting. and southwest Edmonton, as well as Downtown. At over 300,000 sq ft, it has room to house 250 regular and articulated buses. Bus Facilities and Equipment Rehabilitation includes the rehabilitation and improvement of ETS bus terminals, bus shelters, dedicated bus control systems and operations/support areas. Program highlights include the placement of accessible shelters on low floor bus routes, the modification of four transit centres to accommodate articulated buses and refurbishing Belvedere and Northgate transit centres. community demands. Since 2009 ETS has received 42 x 40 ft low floor, clean diesel buses, 12 community service buses and 11 x 60 ft low floor buses. The pilot for Smart Bus technology on buses in the ETS fleet is scheduled to be rolled out by the fall of 2012. The pilot period will ensure that the selected Smart Bus solution meets the needs of ETS business and customers, while validating the costs for the full system. Components of the project include Automated Bus stop Announcements, Automated Vehicle Location, Computer Aided Dispatch, Real-Time Customer Information, Automated Vehicle Health Monitoring, Automated Passenger Counters and Security Cameras with real-time video feed to the ETS Control Centre. ETS’s original fleet of U2 vehicles average 30 years in age and have never had a major overhaul. The LRV Retrofit program replaces obsolete critical subsystems, repairs body damage and corrosion, and refurbishes car interiors. It includes improved security and communications on the vehicles (onboard CCTV, electronic destination signs and information signs). The project to eventually refurbish all 37 U2 vehicles will extend the service life of the vehicles by 15 to 20 years. The Bus/LRT radio system, a critical element for the safety of public and staff and responding to field emergencies, was last replaced in 1989. The planned radio system will address current ETS needs for voice radio communication on the bus, LRT and service vehicles that aligns with long-term transit and COE radio communications strategies. Transit Priority Corridors are designed to speed up the bus system by reducing transit travel time and increasing travel time reliability through the implementation of bus lanes and lane control, bus queue jumps, transit signal priority, and other traffic signal improvements. Major initiatives to enhance the safety and security on ETS include replacements of the CCTV and security systems in Bus Terminals and bus cameras, and a pedway security upgrade. A project to consolidate all bus transit and LRT monitoring into a single, expanded Transit Control Centre in the Corona Station will improve service continuity, assistance to on-road employees, and communications about bus and LRT disruptions, collisions, incidents, personal injury and security issues. The ETS bus and DATS fleet must be replaced on a regular, ongoing basis to manage the substantial wear and tear, and to avoid service interruptions and more costly replacement. Upgrades can help reduce greenhouse gas emissions and present a safe and clean service.